Also think big bank loan, cash in the 401k and hope great-aunt Harriet hasn’t forgotten you in her will. Let’s consider. First, it has been restyled to be a little lower, wider and longer than its predecessor (no slouch) and the styling has been amped up. That big spindle grille seems to flow more beautifully and seamlessly into the hood and front fenders. 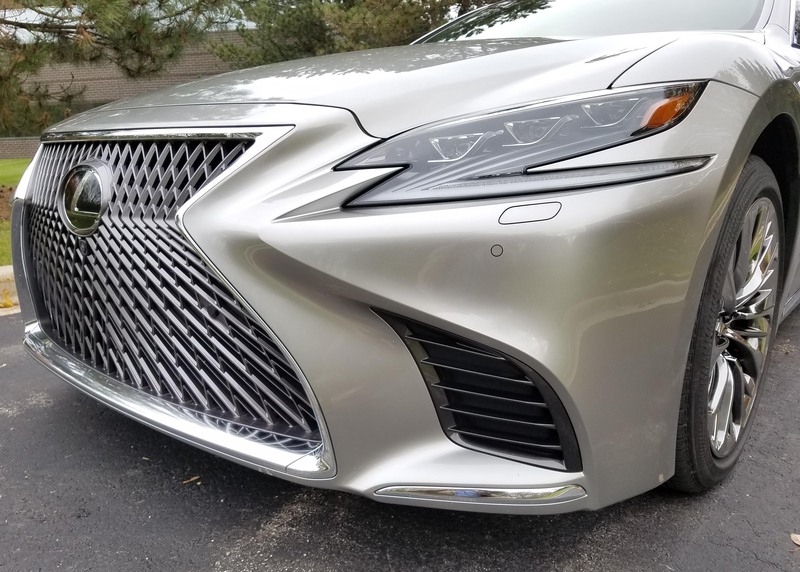 Plus the addition of slashing Z-shaped headlights, and taillights, give the LS more than a dash of drama. But performance, interior styling and comfort add to the luxury sedan’s panache. 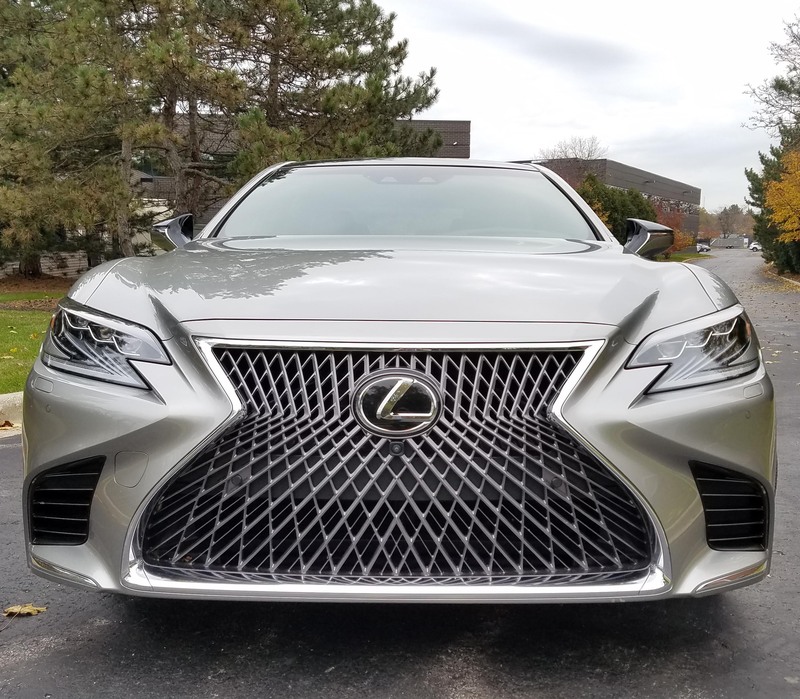 Lexus upped the horsepower by going with a smaller engine. Say what? 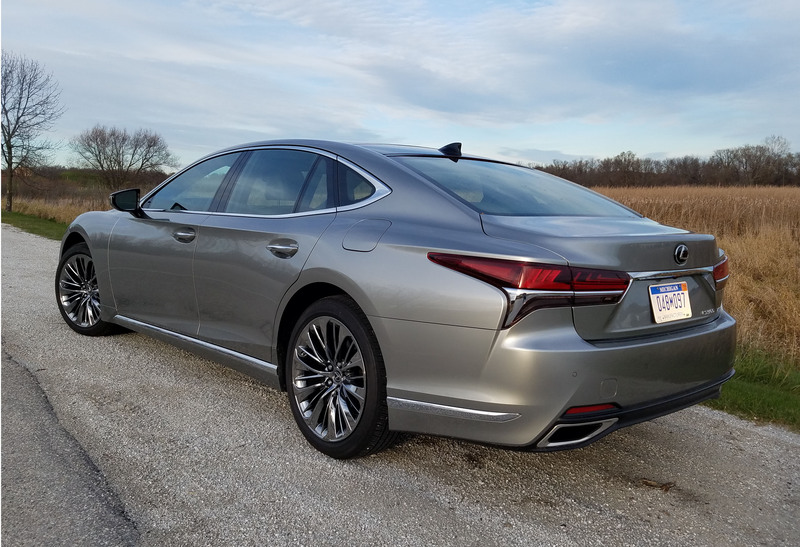 That’s right, the LS drops its V8 in favor of a 3.5-liter twin-turbo V6 that creates 416 horsepower. Power comes on quickly and smoothly, as in the past. Ramping up to highway speeds takes just a few seconds. And while I thought I’d miss the V8’s deep throaty sound, Lexus has tuned this V6 to sound pretty impressive. Ride in the 123-inch wheelbase car is phenomenal. Railroad tracks and crumbling city streets barely register with cockpit occupants. I drove this one down to South Bend, Ind., on a day trip and the highway ride was perfect. Felt like I’d been out for barely an afternoon spin in the car. Gas mileage also was good for a large, fairly heavy (4,707 lbs.) sedan too. I averaged between 25.3 and 25.9 miles per gallon in mostly highway drives. The lower figure included a bit more city fare. 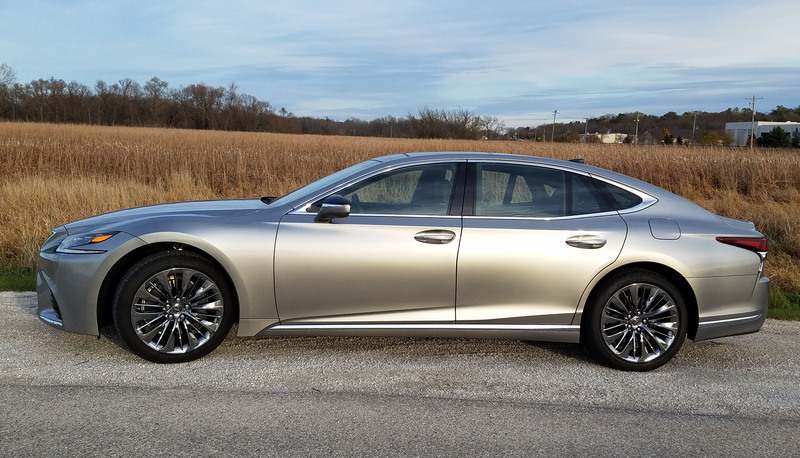 The EPA rates the Lexus at 18 mpg city and 27 mpg highway. The car’s 10-speed automatic helps it achieve these higher figures, plus it’s as smooth shifting as butter in the sun. 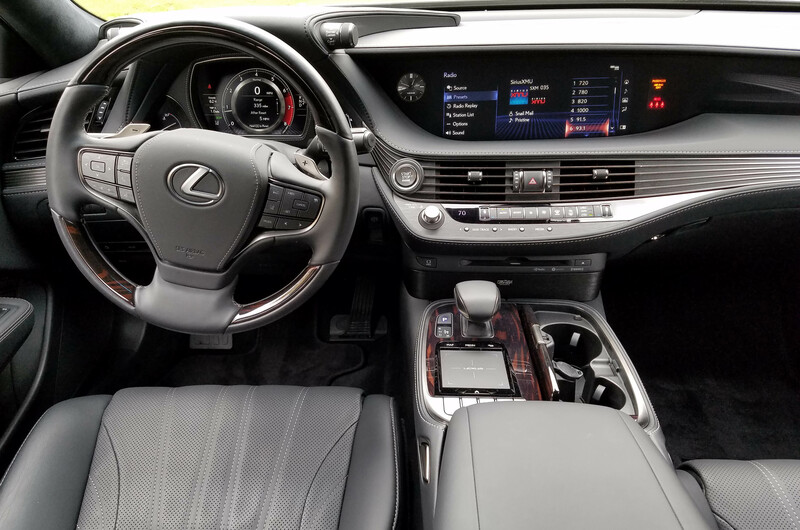 There are six drive modes with the LS, from Eco and Comfort (best in town) to Normal, Custom and then Sport and Sport+. The two sporty settings firm up the steering and suspension and boost shift points for a sportier performance. None make the car feel like it’s track worthy though. One would suspect that Normal and Comfort modes will be used the most. Handling is good, but not terribly sporty, other than the firmer wheel feel in the sport modes. The LS is easy to handle at any speed and on any mode setting. The overall feel is luxury, not performance. But then you likely won’t be racing this one anyway. Braking and safety are well taken care of too. Standard are blind-spot monitors, rear cross-traffic alert, pre-collision warning with pedestrian recognition, smart cruise control, lane departure alert and lane-keeping assist, smart high-beam headlights, cornering lamps, auto-stop and stability control. As if that’s not enough the Atomic Silver test car added a $3,000 safety package with pre-collision warning and active braking and pedestrian alert, active steering assist to divert you from something in the way, front cross-traffic alert and road sign recognition. For $1,200 you also can add a 24-inch head-up system, which this also had. There’s also the optional all-wheel-drive here to help in winter, a good thing for Wisconsin weather and an aid to an otherwise rear-drive sedan. AWD adds $3,200 to the car’s cost. All that is commendable and aids in the driving and safety of the car, but nothing is left lacking inside either. Quiet is the most noticeable cockpit feature, but the black leather seats with gray stitching, which carries over to the doors and dash looks like a sitting room inside a ritzy mansion. This one added quilted leather trim on the doors, part of a massive $12,270 luxury package. More on that in a minute. Trim across the dash was a flat black and silver-trimmed wave-like pattern that seemed to glow at night. There also was a gloss black trim with satin chrome on the doors and a wood and satin-trimmed console. The heated steering wheel was wood and leather. The wood trim costs $800 extra and the heated wheel is $410. Hmm, would think some of this would be standard at a nearly $80 grand starting price. Ignoring the cost, the interior coddles you with everything you’d ever imagined inside the leather-bathed interior. For instance, there are 28-way power front seats with both heat and cooling and a massage function that is nearly as complex as aligning a Rubic’s Cube while you drive. But the rollers in the seats massage you from head to tushie and thigh. That lower part feels a little odd as you drive, but the rest is rather invigorating and would be nice on a long drive. That’s only the start. There’s heated rear seats with power side window sun shades and a power rear sun shade. Oh, and reading lights overhead too. Feeling a bit dozy riding in the back seat? Well, the giant center console has controls to let you recline the rear seats and a footrest pops up too. Really! Rear seat folks also have their own sunroof and manual shade, so they can let in light even if the front seat folks are happy with their power sunroof and shade closed. This all adds $1,000 to the price tag. A lot of buttons on the rear seat console too! 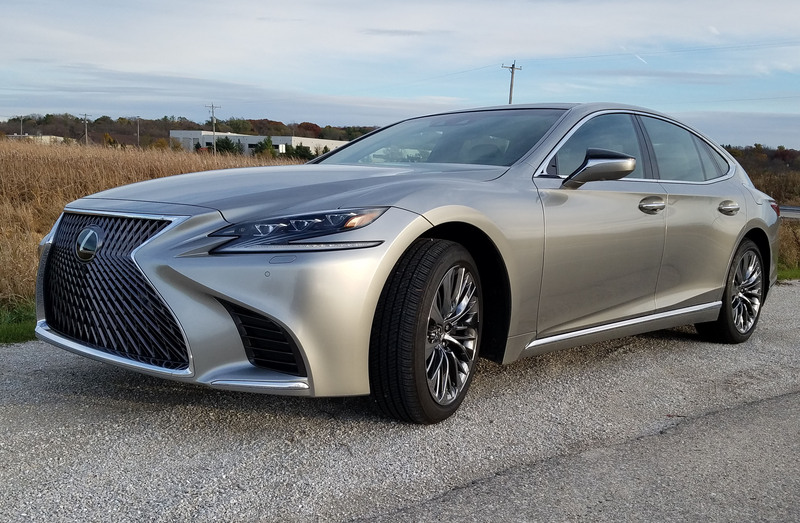 All those fancy seats are part of the $12 grand luxury package, which adds semi-aniline leather trim, an ultra-suede headliner, a 4-zone climate control system, the sun shades and 7-inch touchscreen controller. A 360-degree camera adds $800 and powerful 2,400-watt Mark Levinson surround sound system with 23 speakers (I had 2 big ones in my dorm room!) is another $1,940 (more than a month’s mortgage for most of us!). Is there anything annoying with such a masterpiece? Glad you asked. Yes, the car emits an annoying beep as you back up and it will not abate until the car is out of reverse gear. That, and the still bothersome touchpad controls for the infotainment screen, which is extremely large and easy to see. But the touchpad is hard to use while driving, very distracting and touchy. There’s more, to talk about, like a big trunk that’s power released, fancy wheels and an air suspension so you can adjust ride height. But I’m running out of space here, so check the stat box for pricing. 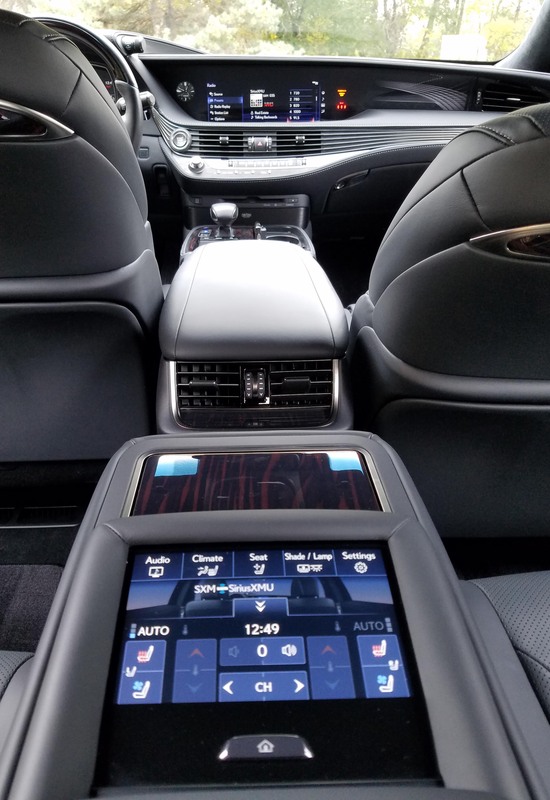 The bottom line is that all this adds up to $103 grand, and change, for a delicious drive that leaves you wanting for little, save an easier to use infotainment system. With that price though it’s possible only a few folks in the neighborhood will be able to afford the LS. But those that can should become your best friends, and soon! Hits: Beautiful angular and stylish exterior, super quiet and luxurious interior. Excellent power and ride w/six drive modes. 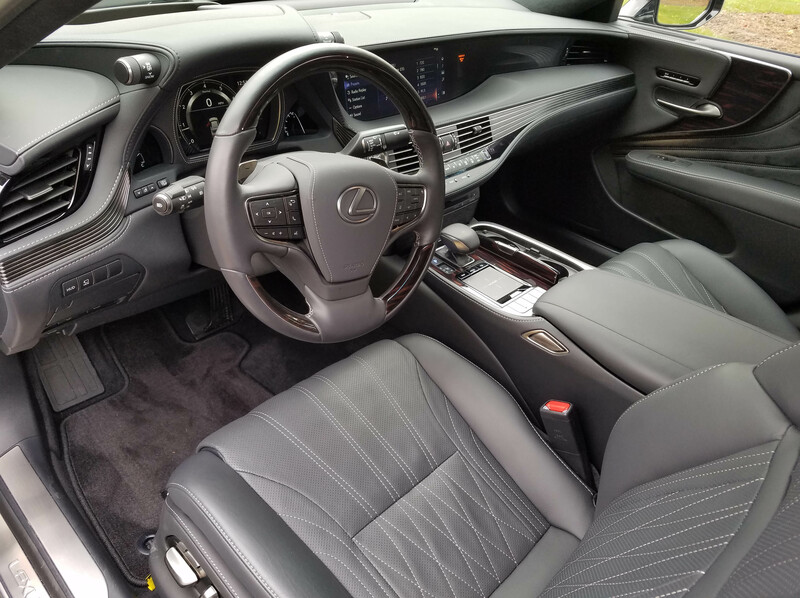 Interior coddles you with 28-way power front seats that also massage and are heated and cooled, reclining heated rear seats and heated steering wheel. Big info screen, power rear and rear side sun screens, dual sunroofs, CD player, 3-memory seats, head-up display, big trunk w/power release, 360-view camera and full bevy of safety devices. Misses: Touchpad control for infotainment is hard to use while driving, and must be used to adjust seat heat/cool and steering wheel heat. Annoying back-up beep when car is in reverse.